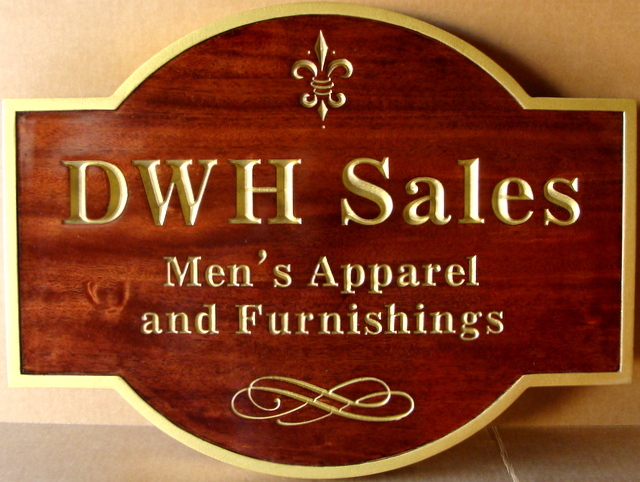 Above is a carved, and engraved mahogany wood sign for DWH Men's Clothing Store. Twenty-four karat Gold-Leaf gilding has been applied to the engraved text, border and art.work. After the wood is stained, he plaque was is coated twice with the finest quality UV clear-coat. This sign can be hung from a scroll bracket or wood beam over a sidewalk, or mounted on a wall or placed in a window.